Saturday evening AMC showed “The Best Years of our Lives”, the first attempt to show a realistic portrayal of war veterans returning home- including nightmares, survivor guilt, trying to fit into a family that has continued to live, and coping with severe disabilities. The movie came out in 1946 and was risqué for the times. I’ve seen the movie on several occasions over the years, but certain aspects of the film resonate with me more today than in the past. The only thing that has changed is time and technology. People are essentially the same. The movie tells the stories of 3 American servicemen returning to their regular lives after World War II, trying to cope with the horrors of war, having to accept their loved ones continued with life and the kids grew up, trying to find jobs, trying to figure out if their loved ones can still love them as they now are, wondering if they still have a place in normal society. I find the film relevant because we still haven’t learned how to re-integrate our veterans back into regular life. The trials and tribulations they face today returning from Iraq or Afghanistan are really no different than in 1946. The primary difference is the progress in prosthetics for those who have lost limbs. However, we haven’t evolved all that much as a society in accepting those who have given their all for our great nation. 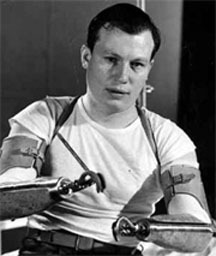 Harold Russell, who played Homer, the double amputee in the movie, has been a personal hero of mine since I was in high school and saw this film for the first time. Russell lost both of his hands in a training exercise for paratroopers. William Wyler, the director of “The Best Years of Our Lives” saw him in an Army training film and cast him in the movie. Russell won two Academy Awards for his role – one for best supporting actor and the second for serving as an inspiration to returning veterans with combat injuries. Even today Russell is an inspiration. He didn’t allow his injuries to limit him. He didn’t give up and succumb to self-pity and throw himself on the mercy of the government and the taxpayers. He married, had children, and became an advocate for wounded warriors, helped found AMVETS and served as its national commander for three terms. Additionally, he was appointed to and also served as chairman of LBJ’s Committee on Hiring the Handicapped in 1964. Wow! This was an American hero and an inspiration to us all. Why are there no statues honoring heroes such as Russell?